What is better than a beach party? A beach barbecue! What’s better than a beach barbecue? A beach pig roast! If you are ready to create a memorable party with something fun that brings the whole crowd together, consider this unique addition to your event. Not only is it a crowd favorite, it is also a favorite of Chef Mat. He loves the island vibe that a pig roast creates. It is communal, casual, and as Mat says, “you can’t be pretentious at a pig roast.” Kick off your shoes, enjoy the view and the company–and of course, the smell of roasting pork mixed with the salt air. 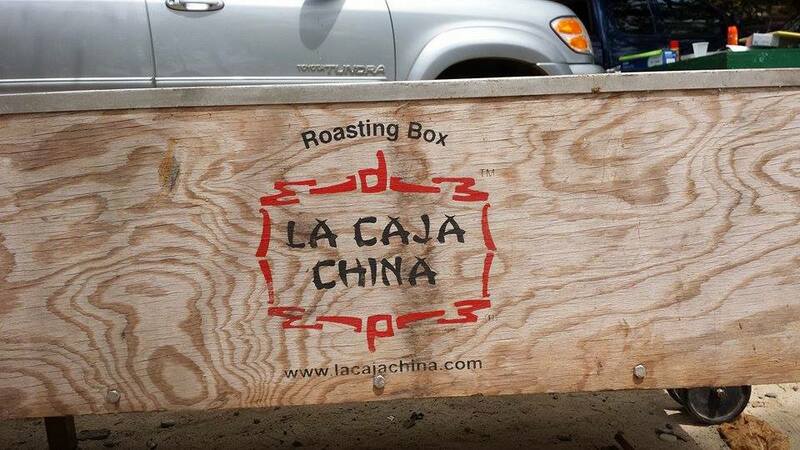 While you don’t have to have your event on the beach, you do have to be somewhere outside with space for the portable oven, known as La Caja China, or the China Box. The wooden box has a metal liner and a grate to hold the pig, then a metal tray that sits atop the pig that holds the coals and a lid to seal in the heat. This unique cooking technique cooks the meat in about 6 hours from start to finish–about half the time as a traditional spit does–but the preparation at St. John Catering starts at least a day before. Chef Mat says that the first step is that the pig is marinated by injecting a chimichurri type sauce called mojo that is bursting with citrus and herb flavor directly into the meat. It is then rubbed in salt and left for 24 hours to cure. On the day of the event, the coals are lit and once they have come to temperature, the pig is laid belly side down and will roast for about 3 hours. 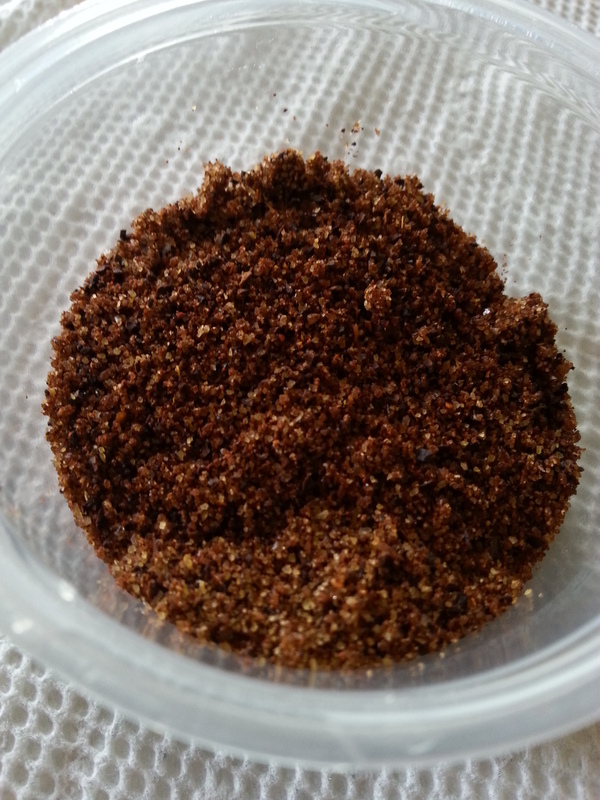 Then it is carefully turned over and roasted for an additional hour. The pig then rests before slicing. The end result is a moist and tender meat with a smokey, crisp skin–the perfect combination and what every grill master is after. The meal is complete with a selection of sides including a skillet cheesy cornbread with scallions, potato salad, pasta salad, a variety of vegetable sides and fresh green salad with homemade dressing. 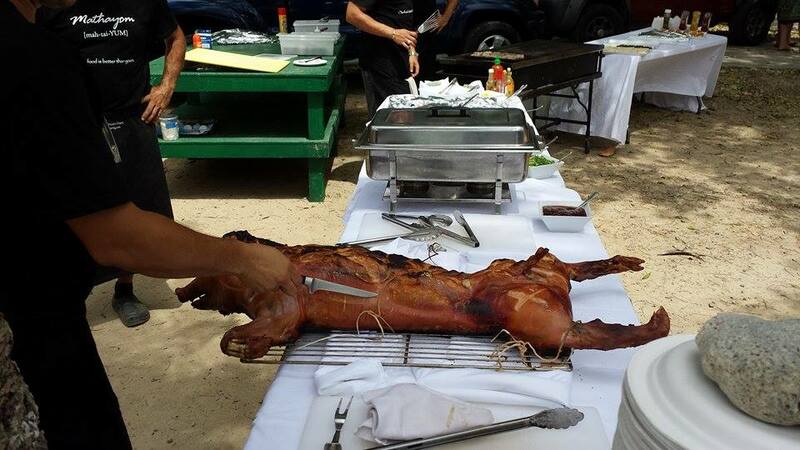 A pig roast is perfect for a welcome party, a birthday celebration, and is absolutely ideal for a beach wedding or any gathering with 40 people or more. The pricing is $75 per person and includes two chefs to cook and carve the pig, all sides, set up and clean up. Servers are also available at additional cost. 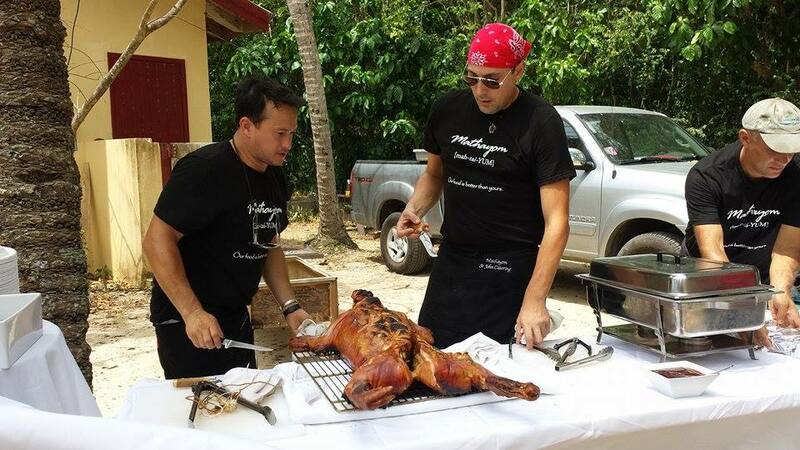 Contact Mathayom and St. John Catering to set up your pig roast today! The tale of the Java Booty Rub dates back to the year 2010, when Chef Mat was busy working to create a signature hot sauce, and was confronted with the new regulations of the TSA that denied liquids over 3 oz. Still wanting to make sure that visitors were able to take home a memorable (and tasty) reminder of their stay on St. John, Java Booty Dry Rub was born. Drawing inspiration from this Thai background and wanting to create a flavor profile that excited all parts of the tongue, Mat spent hours measuring and adjusting and a week of tasting to make it perfect. The end result is a smokey, earthy, sweet and spicy rub that works on any protein or vegetable and will please a wide audience of diners. After gaining popularity during private diners, weddings, and other functions, there was a demand for Java Booty with locals and tourists alike. With that, the rub was packaged and offered at Starfish Market in the Marketplace, and most famously at St. John Spice in Wharfside Village, where about 100 pounds are sold annually. There are even diehard fans in the state that receive Java Booty by the pound in the mail. So much flavor in this little cup! Wondering what the secret is? We can’t give it all away, but the stars of the mix include coffee, smoked salt, coco powder, brown sugar, chili, paprika, cinnamon, and SECRETS! The current proprietary blend does contain semolina flour as an anti-caking agent, however a gluten-free mix is in the works! To get your own taste of this treasure, book with us today and request it on your protein! Stuck stateside for awhile? Send a message directly to mat@stjohncatering.com and inquire about having some sent to your doorstep–just in time for summer grilling!